Memory fails as to who introduced me to this Nicaraguan gem. I have a feeling it was Dougie from the office when he went down there. I was initially a bit doubtful, but since I was trying to scare up some good stuff for the first non-whiskey night of Liquorature, which thus far had been exclusively a Scottish binge, I felt it was necessary to pull out the stops: I had already bought the Appleton Master’s Blend and the Zaya, and this one’s price point fell somewhere in between. 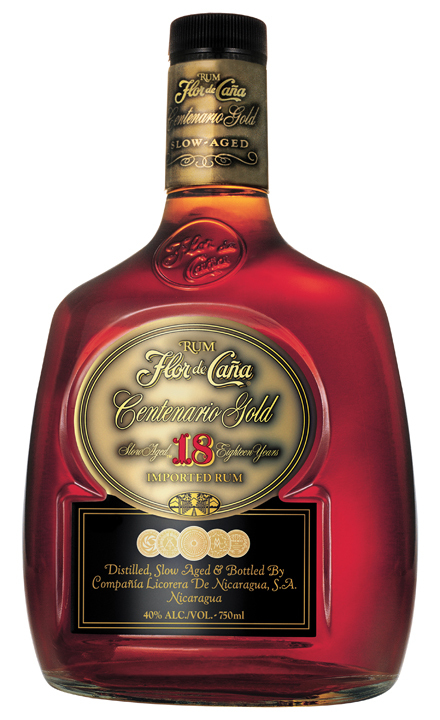 The oldest of the Flor de Cana rums made from molasses, this sweeter than average dark brown rum is aged for eighteen years in used whiskey or bourbon barrels, yet somehow avoids that harsh bite so characteristic of rums aged in whiskey casks (like Renegade’s offerings). Because it is younger than the Appleton Master’s Blend, it isn’t quite as pretentious either, and so I deplored the similarity of the bottle with the 12 year version somewhat less. This is also the darkest of the rums we had that night, a rich clear brown with a slightly red tint; and, poured, it releases a nutty, smoky aroma, with hints of burnt sugar. The taste in the mouth is superb (but note that my own predilections run slightly more to sweet than the average, so I won’t pretend this will work for others), sweet and spicy – those caramel notes really start to come out if you can hold it on the tongue – and a bit of oak flavour that begins to dominate after a bit. Actually, more than a bit. As you sip, the oak overpowers everything else and though the finish is smooth and fine, I felt that for an 18 year old, this was not quite the standard I expected. I think I’ll have to go back to this. The issue for me is that the 12-year and even the 7-year Flors are fantastic for their ages, and the balance that I found tipping to the oak here, is better handled in these younger offerings. They are simply better on the texture and body, while their finish is a little less. Now I’ve been accused of taking one sip, passing judgement, and drowning the poor baby in coke at the first hint of distress (a holdover from my plebian past where a flattie and a bowl’ice plus pepsi was all I needed to go with the curry goat I had an hour before), but unfortunately here it was almost necessary. I’d take the 12-year neat, and the 7- with some coke, but the 18-year old, sadly enough, and good as it was, did not move me to treat it with the great degree of reverence I initially thought it deserved, and therefore I shrugged and bastardized the poor thing. Again, I stress this is one of those I have to go back to, so my review may change; right now I’ll place it in the first tier, just not right up at the top. Second shelf, perhaps. I’m hoping it’ll move up.